and to be hospitable to a relatively wide range of traditions and cultures. It is composed of contributions from the long history of Christian psalmody as well as from the recent outpouring of new psalm settings from a wide range of Christian traditions and cultures. Whereas most collections of psalmody focus on one approach, this volume draws freely from a wide variety of approaches and styles, providing multiple options and making it possible to easily compare the strengths of each. This range of material means that the book is well-suited to a variety of uses. This book is designed for use in corporate worship—to be placed in the hands of worship leaders, choirs, and, ideally, all worshipers. Most congregations across the wide spectrum of approaches to worship will be able to find at least 100 settings in this book accessible and fitting for their own approach, another 100 that they can easily learn, and then several dozen (or hundred!) more to stretch them in new directions. This means that the book is useful, even if a given community is not attracted to or able to sing the full range of material. Wise use of the materials in this book will require careful thought about which settings are most appropriate in a given congregation and what kind of introduction will help people engage each setting thoughtfully. This volume is also designed for communities or groups committed to services of daily prayer at morning, noon, evening, and/or night. The inclusion of simple liturgies for these traditional services means that a community could celebrate daily prayer using only this book and a Bible. This book is ideal for personal and family devotion. It belongs on pianos and music stands of those with musical abilities. The texts alone provide a treasury of material for daily contemplation and prayer. 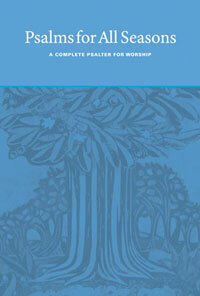 This Psalter is also a resource for bible study, particularly as an anthology for courses on the book of Psalms. For pastors preparing to preach on a given psalm, it can function as a commentary on the book of Psalms. Each musical setting of a psalm is, in its own way, a miniature sermon or interpretation of the psalm. Comparing the range of approaches to a given psalm offers an insightful introduction to the challenges and possibilities of the biblical psalms in guiding the Christian life. Finally, this book is intended to inspire composers in a wide range of cultures and traditions to imagine new, vital, and faithful ways of rendering psalms. Many settings in this book are suggestive of new approaches that might develop and mature over the next several years—a task that calls for deep and creative engagement by the next generation of pastoral composers and text-writers.